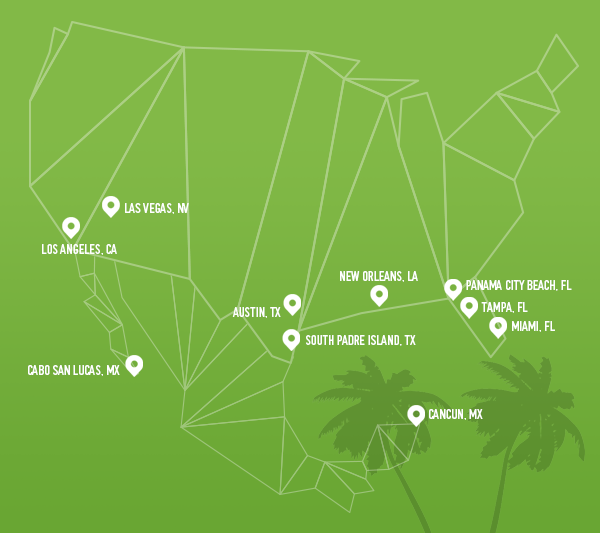 For marketers, spring break is a dream come true. Students are looking to let loose and blow off steam from the school year, making them highly receptive to branded marketing efforts. 95% of students, ages 18–24 own a smartphone¹—and they’re not afraid to use it; which makes spring break the perfect opportunity for marketers to use location intelligence to their advantage to send out relevant advertisements. Cool, relevant campaigns always receive an A+ from spring breakers. The trick? Know your audience. Take it from Malibu Rum, who worked alongside xAd to craft a media rich, location-based ad campaign that is suited perfectly for spring breakers. Malibu Rum brought a taste of sunshine to the mobile screen with its Best Summer Ever ad campaign. Users could craft cocktails by mixing rum with seasonal flavors like coconut and pineapple. Options to share their creations, find a retailer and search recipes online helped continue the conversation and encourage engagement. Trying to entice students to escape a chilly location in favor of somewhere warm and sunny that you can target? Advertisers can also craft dynamic creative for location-based marketing that ties in weather and time to send strategic ads that promote sunny locations to those who might be in colder geographical locations. Now that you know where to find Spring Breakers and what their habits are—how are you planning to make your activation stand out in this crowd? Using xAd’s location-based marketing Blueprints™ technology, marketers can target age-specific demographics in the most popular Spring Break locations with Rich Media advertisements that are sure to capture their attention—and wallets.